Mount Etna is one of the most active and best-studied volcanoes in the world. It is 3,329m high and has four summit craters. There is frequent lava flow. It has the highest frequency of recorded eruptions in the world (193). This stratovolcano has been studied and monitored since the 19th century. The Roman poet Virgil gave what was probably a first-hand description of an eruption in the Aeneid. March 2019 - our first journey with daughter. We decided to go to Sicily. It was on our list for ages and finally we made it. From the plane, landing in Catania, one can see the Aetna Volcano rising above the island. 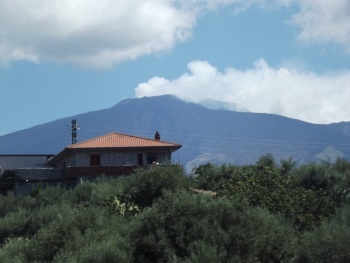 During our day in Catania, we always were looking up to the Vulcano, hoping to see some fumarols. Day 2 we took the Circumetnea train to Bronte and back. We got some nice views at the Volcano and understood its extend. Bronte was not as interesting as exoected, but the stunning views at the lava beds and the train ride itself, were worse it. Next time Sicily we will definitely visit the top of Aetna, but with a 3 months baby and March with the snow, are not the best circumstences. We drove further to Palermo, than south and than back to Catania. Always in the shade of Aetna. From Bronte we did short trip to Rifugio Piano Dei Grilli, which is already in the buffer zone of WHS; (photo: View from Rifugio towards Etna). However, the road from Bronte crossed the lava flow that already belonged to the core zone. From the Rifugio, there are quite a lot of marked trails going inside the national park. I felt like in gardes of Eden there, because everything was in bloom in May. 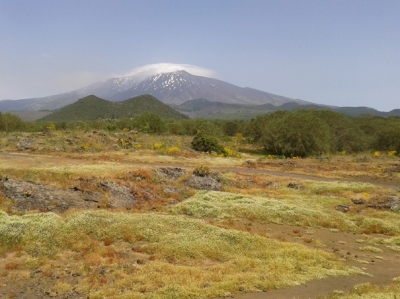 I enjoyed the trip a lot even without climbing the steep slopes of the Etna stratovolcano. It's hard to even know where to start with a colossal site like Mount Etna. We decided to base ourselves in the town of Trecastagni, and as luck would have it, our Airbnb host recommended a fantastic local guide, a Sicilian named Dario Vaghi. We'd hoped to do some hiking and really explore the upper reaches of Etna, but unfortunately the day we visited there was a heavy blizzard near the top and the cable car wasn't running! No problem for Dario - he knew several other fascinating spots for us to visit and explore. As you can see from the video, we really got to explore all the different facets of Etna: its climates, ecosystems and various habitats. What a magnificent spot. My journey around Mount Etna was most enjoyable. 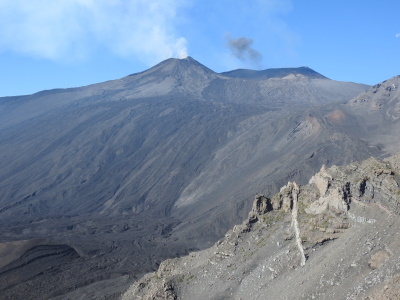 I viewed the mountain from the south, west and north, and had close up experience of crossing old lava flows. All this was in the comfort of a seat of the Circumetnea train. I travelled from Catania to Giarre on the Circumetnea, stopping for a refreshment break at Rendezzo on the way. After Rendezzo the mountain was obscured by cloud. From Giarre I returned directly to Catania on the main line. Mt. Etna is of universal value. As UNESCO notes Mt. Etna is an active volcano that yields information to scientists around the world about geological phenomena that affect millions of people, not only in Sicily but around the world. Because of Mt. Etna's activity a visit to the park can reveal different landscapes (and paths of destruction) from year to year. It has served as a proving ground for a variety of techniques to stop or divert lava flow (some successful, some not) to avoid populated areas. The surrounding areas of the park are of a stark, stunning beauty and yes, there are some great hikes (or just walks or drives) available in the area. Many of the surrounding cities and towns are built with the volcanic rock that Etna has spewed out over the centuries. Mt. Etna also holds a place in Western literature. In Greek and Roman mythology it's the home of Hephaestus (Vulcan in the Roman pantheon)and features prominently in Milton's Paradise Lost. It has become the background for any number of generic views of Greek theaters. (Think Woody Allen's "Mighty Aphrodite. ")Possibly only second to Vesuvius in notoriety, Mt. 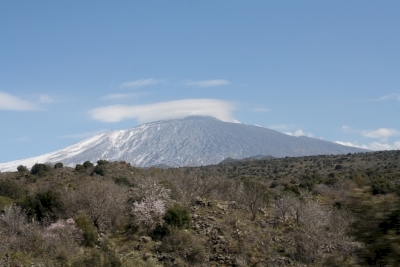 Etna is a unique natural wonder. Posidonius: Mount Aetna covers the fields around Catana in ash-dust. Star Wars: This active volcano was used as the background for the light saber battle between Obi-Wan Kenobi and Anakin Skywalker in “Star Wars Episode III: Revenge Of The Sith.” During filming, Mount Edna erupted and George Lucas sent his team to film the lava flows.